The Summer beer festival season has passed and the month of November is fast approaching. 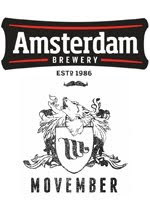 With November, being the month dedicated to prostate cancer awareness, The Amsterdam Brewing Company will host a Movember Fundraising Festival of Beer onNovember 25th, 2011 from 8pm-1am in their brewery event space at 21 Bathurst St.
“We thought it would be a great idea to open up our brewery to support a great cause, raise some money and have a blast doing it. We’re planning on offering some unique one-off beer with Movember spins alongside our regular line-up of beer.” Says Amsterdam media contact Blake van Delft who is the lead organizer on this fundraising event. “We’re also opening up the festival to other breweries to make it a beer festival of sorts. We’re hoping they can commit a keg or two of their great beer in support of men’s health.” All proceeds from the evening will go to supporting the Movember fundraising campaign. A limited quantity of 250 tickets will be sold and will be available starting this week from the Amsterdam Retail Store at 21 Bathurst St.
Be sure not to miss this great event for a great cause! TAPS Magazine Fall 2011 Issue Now Available! Received Some Innis & Gunn "Beer Mail" Today!